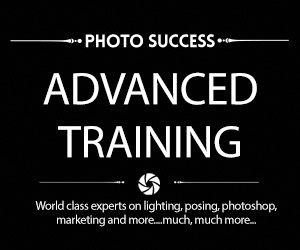 I been saying this for decades…..well, since digital came into my life and photography studio. And completely transformed EVERYTHING….for the better. 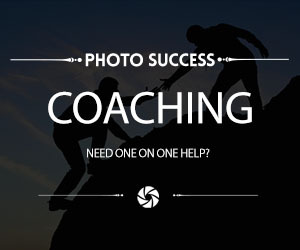 If you want to get gooder at photography, at seeing the light, mastering composition, predicting moments and honing your skills, get a small point and shoot camera. And bring it with you everywhere. Go on adventures. Challenge yourself. PUSH the boundaries. It’s like when you see those rock bands traveling on a bus and they have a little baby amp, and they’re playing, practising, honing. Same idea. BU’cept it’s music. Same idea. BU’cept it’s light. And all things visual. The benefits are huge. And it’s a whole heap of fun. Try it. P.S. CELL PHONES DON’T COUNT…..trust me on this one. Yes, some will create decent images with their phones. But, for most of us’em mere mortals, the INTENT goes away. She was barely 1.5 years old. Way before she developed a sense of dignity and shame. We were out on a Sunday family drive…and ended up hours away from home. I had my camera and some black and white film. Always shooting. I bring a camera with me always, everywhere. 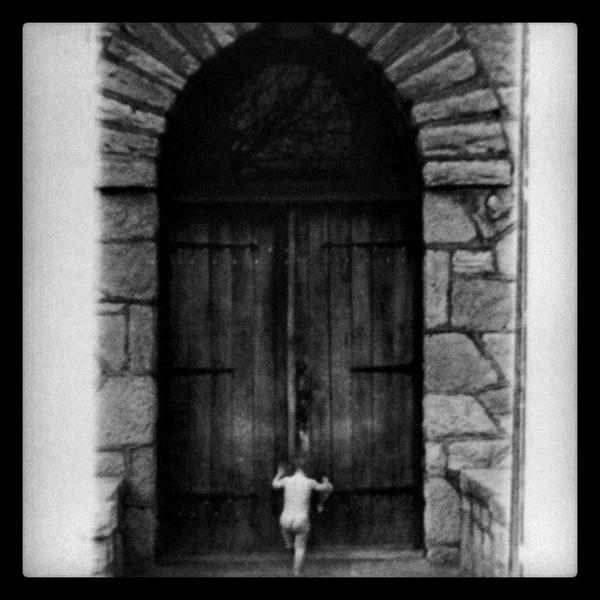 I strip my babies close off and tell her to go check out the church……she runs to the huge wooden doors and tries to open them. That was the moment I wanted. I grabbed a few exposures of the exposed little one, and eventually entered it into competition. I titled it “Knocking on heaven’s door”. There are two big lessons for you. One, always be shooting, even if you only bring a point and shoot camera with you. School is never out for the pro. It’s a good thing to constantly hone your skills. And two, awards don’t amount to a hill of beans unless you like collecting trophies and ribbons. Seriously. That was a “grab shot”. 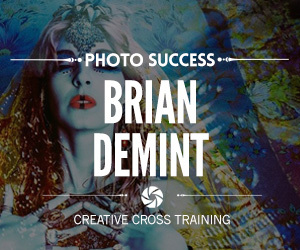 Does not reflect what I create, for profit, day to day, in my photography business. Fun, yes. Great to get recognition and feathers for my cap from my peers. Yea….all good. Sure, there is some publicity value in awards. But it is miniscule when compared to the true power of publicity and what it can do for you and your photography business. 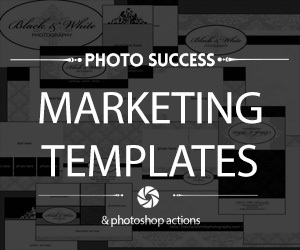 Publicity is the very root of branding and market position. It’s HUGE…. I created and gave an intensive presentation on this topic and created an extensive report on publicity as well. 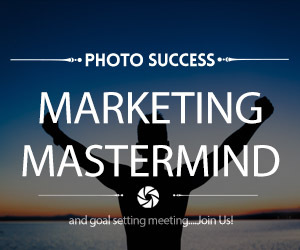 It is yours, and so is the equivalent of the library of congress on marketing for photographers, in my marketing system I created. I can show you how to maximize publicity for maximum profits and maximum long term growth and market position….. There is NO better place and time on earth. Breezing down the highway on my two wheels. The smell of forest, grass, flowers and diesel exhaust from the trucks blowing by me. Fun. Me loves my motorcycle. Oh, let’s not forget….the occasional bug zipping into my mouth or blasting into oblivion onto my cheek. Stings. Ouch. Keep it real. Yes, fun. Loads of it. Nothing better for the soul. A friend who I haven’t seen in a while contacted me to go for a ride. Guys do that when they own motorcycles. They just go for “a ride”. No where really. We breezed by the local Tim Hortons earlier as we headed out of the city. The parking lot starting to fill up with Harleys. Some guys like to park their bikes in the parking lot, stand around and talk while getting fat on donuts. Not I. I’m way too anti-social. I like to get out there. The open road is calling me. It’s relaxing. Exciting. No agenda. Just go…..pure zen! Ain’t no zen standing in the parking lot eating donuts drinking coffee. As were riding along, I double duty multi-task, keeping a close eye for anything that might hop out into the road and I also let my mind drift into creative thought. I get some weird ones. You don’t wanna know. One thought popped into my head. Being chased by a giant T- Rex…. “How was your ride” Tina would ask when I returned later. I come up with these ideas because I like to ask weird, deep probing questions. And then another image pops into my head. 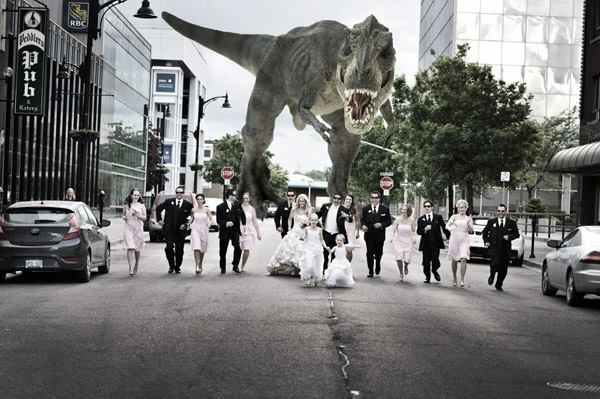 One I saw not so long ago on FlakeBook… where there was a T-Rex chasing a bridal party. “Hmmm, maybe I should swipe that idea…” I thought. And then I started thinking about work. Dam! It always reverts back to work. But I’m getting better at pushing those thoughts aside. I was thinking about the current wedding I was working on and how I had to get on it. I’m falling behind. I push the thought aside. I feel better because I make a commitment right there to put in 30 minutes later on that night, which I do. And I go buy a stock image of a T-Rex. And I place it on one of my bridal party running shots I routinely take on just about every wedding. Is it flaky? Who knows? I’ll let the bride decide. She gets the big vote. Personally, I think it’s a fun, quick smile trend. Not going to last. Not going to get too excite about too many trends. In weddings, there is only ONE real solid idea that works. One trend…. Here it is: Capture the heart and soul, the story of the wedding day using the best in composition, documentation, light, timing, your creative eye. It’s not about anything else. 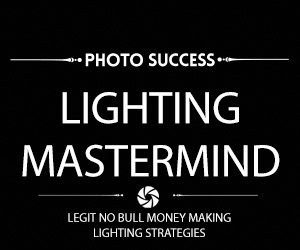 Not the equipment, cool off camera flash techniques or anything other than your ability to create images that resonate. And here’s a really cool secret. It’s very, very simple. But so is a musical scale when you think about it. And look what the likes of Rachmaninoff created with musical scales. Simple, yes. Creatively complex. Yessirreebob…. But achievable for the dedicated. It’s why I created my wedding success system and so many other videos from the likes of Vanessa Joy…. For the serious “Rachmaninoff” photographer in you who wants to totally crush their wedding photography. Meanwhile, may you find your zen like state where images of being chased by T-Rex’s join all your other thoughts…. P.P.S. Also, last month, Travis Gadsby gave us some cool insider secrets and strategies… “Maximizing your online presence with software that does the heavy lifting.” In the forum HERE.